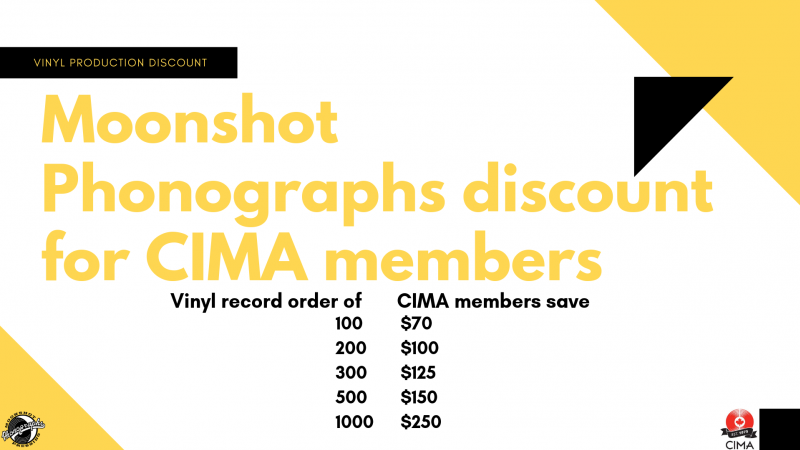 CIMA’s Updated Membership Discount - Moonshot Phonographs Inc.
About Moonshot Phonographs: is a Canadian vinyl record pressing plant, that handles the whole vinyl experience for you. Moonshot has a supply chain that allows us to give you almost anything you want. Their PVC is chosen for being record-perfect and environmentally safe. Only the proven artisans are enlisted for lacquer engineering, stamper forming, and printed packaging. From UPC barcodes to download hosting to shrink-wrapping, they handle it all. The Moonshot facility is where it all comes together. Their high-tech WarmToneTM press makes a perfect record each time, because any deviation in the process is detected and corrected. Careful visual and audio inspection ensures that nothing leaves our plant that doesn’t meet the highest standards. In fact, they'd rather not take an order, than accept an order that can’t deliver as expected. Vinyl is a medium on which to imprint your music. Each order is exciting here at Moonshot, because it represents the hopes and dreams of an artist, as well as a medium to the soul that can live on and on. That means Moonshot will connect with you as often as you need, because it’s your vision they're crafting. They don’t make widgets; They make multi-faceted canvases for your art. You’re reaching for the moon. Moonshot's here to help you get there. Give us a call!